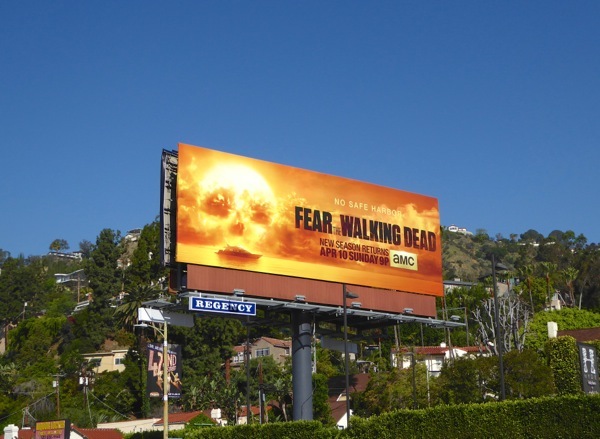 Sometimes a billboard comes along and you think it's just perfect for the series or movie that its advertising. 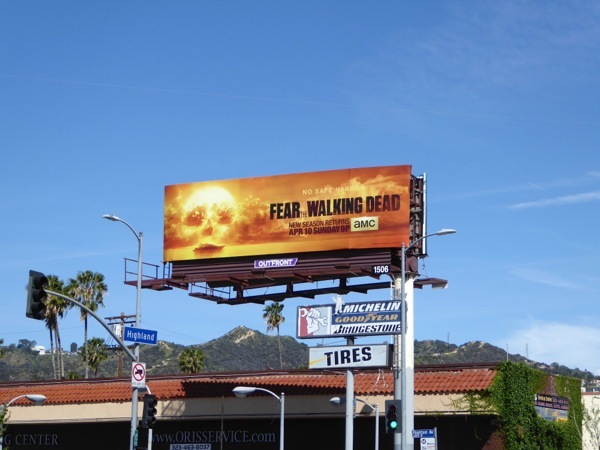 The key art for the second season of Fear the Walking Dead is just such an outdoor ad. 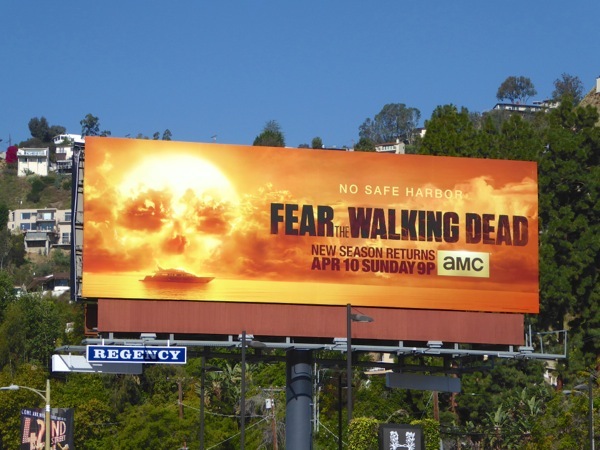 No zombies or gore are needed to convey the ominous sense of dread when you have this sun and clouds skull imagery, and the 'No safe harbor' tagline and yacht illustrate that The Walking Dead prequel spin-off is trying to do something different than the parent show. 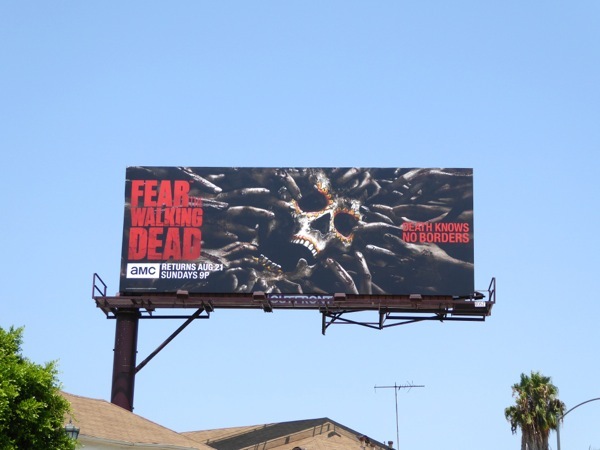 Not only is the series treading new ground, or water, but there's also another departure from the original series with regards the artwork, as TWD season promo billboards have always focused on the character of 'Rick Grimes', whereas this companion series showcases evocative scenarios. Kim Dickens and Cliff Curtis' blended L.A. family are back to try and survive the dawn of the zombie apocalypse on the West Coast. If the land has become treacherous, then maybe a life on the open water will save their ragtag band of survivors. Unfortunately you ultimately need to return to shore for supplies at some stage, and then you have to face the double threat of the undead and other humans who want your floating sanctuary. 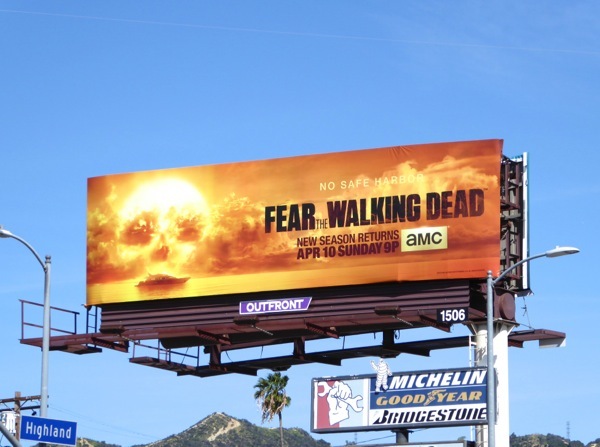 These striking second season billboards were photographed along Sunset Boulevard in West Hollywood on March 17, plus further east above Fountain and Highland Avenues on March 22, 2016. 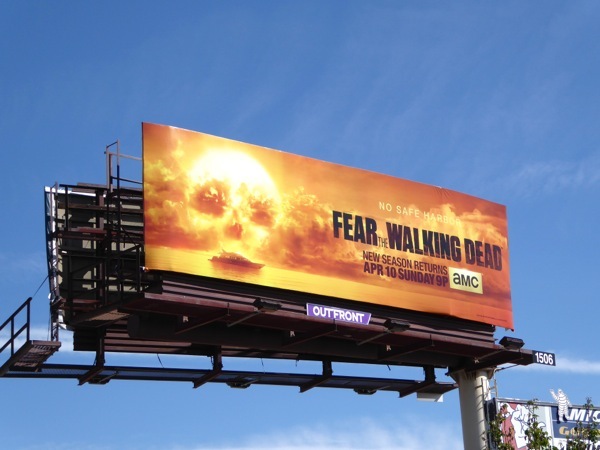 If you're a fan of the show, be sure to also check out these Fear the Walking Dead season one billboards and all these season promo billboards for The Walking Dead original series. 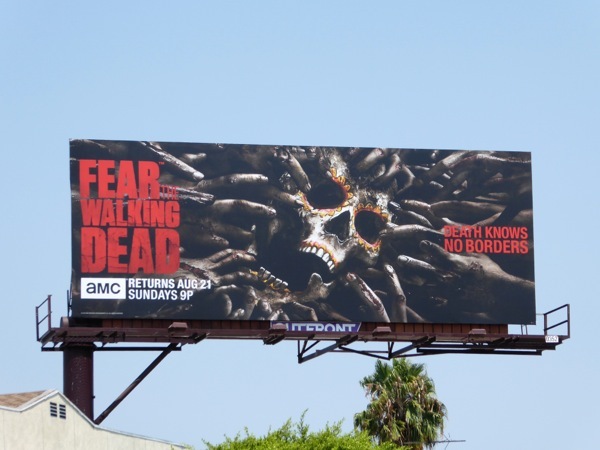 For more cool skull imagery, you can also enjoy these billboards for The Curse of Oak Island, these Sons of Anarchy final season billboards and these Terminator: Salvation movie billboards. 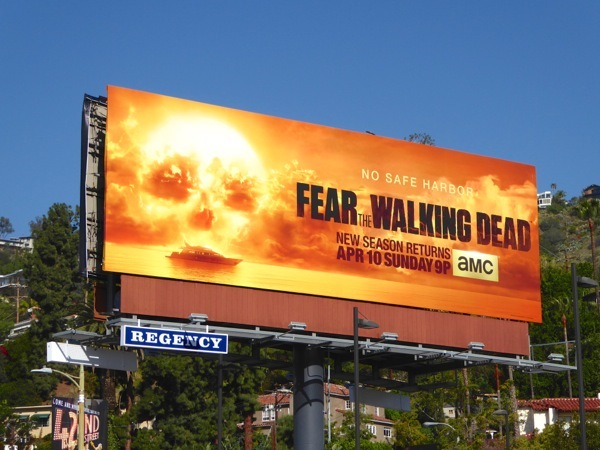 All hands on deck, it's almost time to set sail on another dramatic season of Fear the Walking Dead. Who will live, who will die, who will fall overboard? If televisual history has taught us anything, no one is safe. 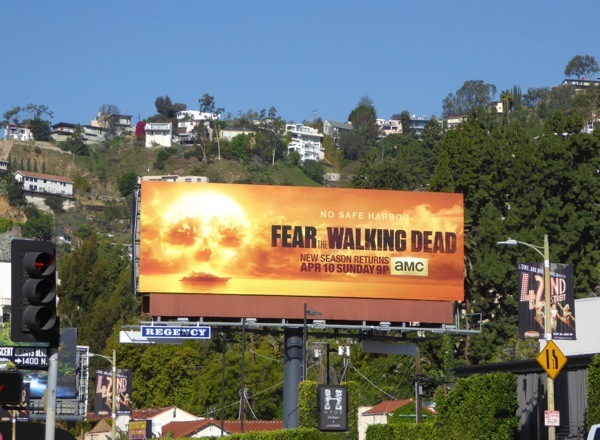 UPDATED: Fear the Walking Dead is certainly charting a different course for itself and even venturing south of the border to Mexico to provide a different take on the zombie apocalypse. 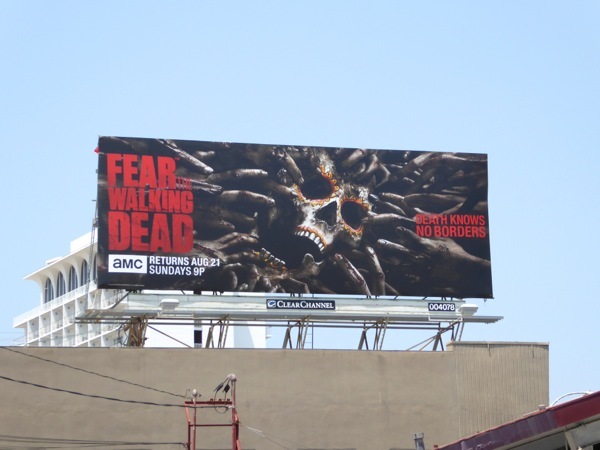 These 'Death knows no borders' midseason billboards for the second season are very clever with the Day of the Dead skull and clawing zombie hands, but they also tap into the hateful rhetoric of the Donald Trump election campaign which promotes erecting a wall between the U.S and Mexico. 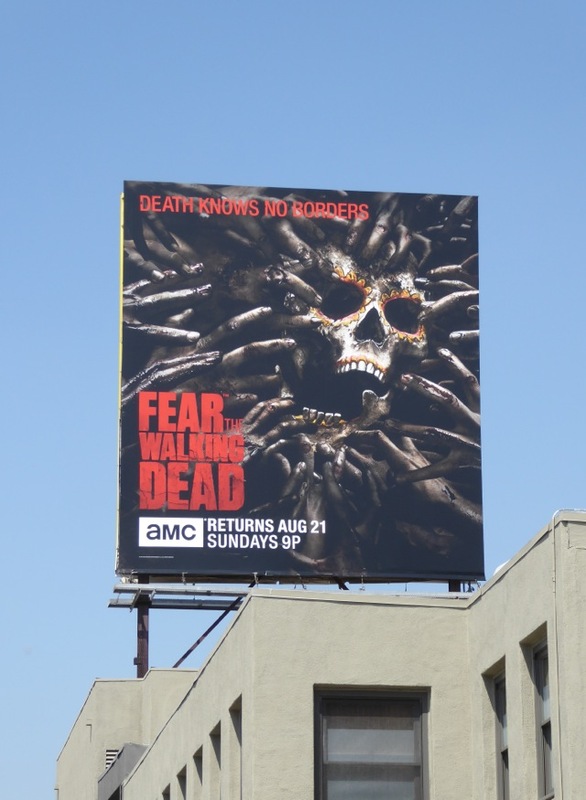 This creepy ad creative proclaiming death is death wherever you're from, or live, were snapped above La Cienega Boulevard and Pico Boulevard on July 29, 2016. In addition here's also a portrait version of this Dia de los Muertos skull billboard spied along Beverly Boulevard on August 10, 2016.